Qatar Airways announced a new promotion under the name 'Premium Companion Offer', with exclusive booking discounts of 20 percent during the promotion period for two or more passengers travelling together. The promotion is valid for bookings between February 11-18 on Qatar Airways flights in Business Class, for flying until December 11. 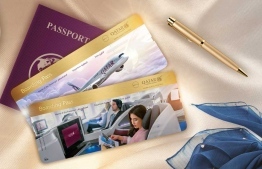 Additionally, Qatar Airways will grant double Qmiles and Qpoints for passengers flying in Business and First Class. Chief Commercial Officer of Qatar Airways, Ehab Amin, said, “Travel is even more special when it is experienced in the company of family and friends, and what better way to celebrate this than by taking advantage of Qatar Airways’ Companion Offer. With this unique promotion, we want to encourage our passengers to experience the many special moments travelling together can provide". To book flights, passengers can visit qatarairways.com or any Qatar Airways sales office, or contact the nearest travel agent. Qatar Airways is one of the largest airlines in the world with a modern fleet of over 230 aircrafts that fly across six continents. The airline was named ‘World’s Best Business Class, ‘Best Business Class Seat’, ‘Best Airline in the Middle East’ and ‘World’s Best First Class Airline Lounge’ in the 2018 World Airline Awards, managed by international air transport rating organisation, Skytrax.